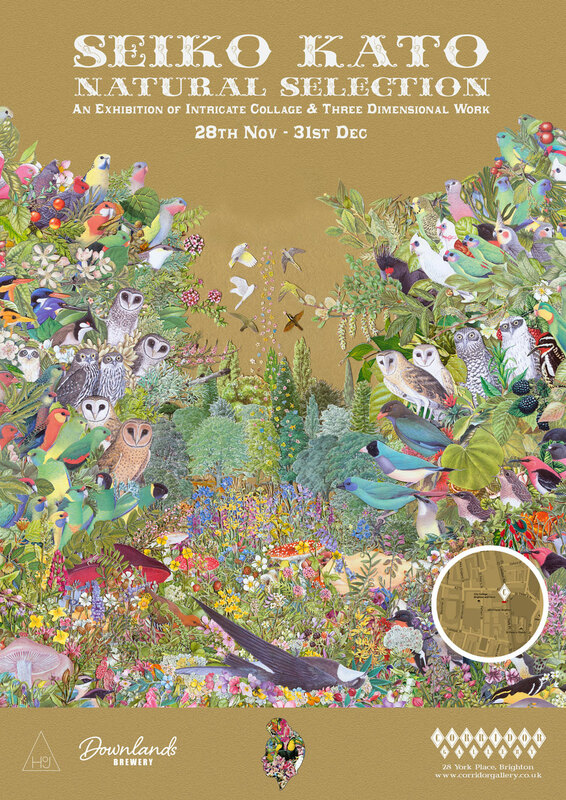 This December, Corridor Gallery and House of Juba invite you into the magical world of Seiko Kato, a captivating installation of intricate collage work, featuring both two and three-dimensional pieces, including the opportunity to see Seiko working live, giving fascinating insights into her creative process. Corridor Gallery has collaborated with Seiko Kato to devise a unique installation inspired by the artist’s detailed, hand cut work, transforming our gallery space into a mystical wonderland, evocative of the playful spirit of Seiko’s work. Originally from Japan, Seiko has made Brighton her home. Described as “the Goddess of collage art”, Natural Selection presents an eclectic body of work, collating sources from Victorian nature studies, anatomy and the decorative arts. Natural Selection describes Seiko’s creative process while alluding to the subject matter of much of her work. The exhibition will include rarely exhibited mixed media sculptures, housed under imposing antique bell jars, simultaneously fragile and darkly potent. In addition, Corridor Gallery is delighted to showcase new and exclusive collectible works, including printed silk scarves, unique collages and other curios. Seiko Kato is a graduate of Illustration at Brighton University. Her work is regularly exhibited in London, Europe and Japan and her growing international following continues from her recent solo exhibition “Natural Fragments” in Bangkok. Seiko’s work is much in demand and has been featured in numerous group shows including works displayed in the Brighton Museum, The Brick Lane Gallery, Selfridges, Somerset House in central London and the Strychnin Gallery in Berlin. Corridor Gallery is located on 28 York Place in Brighton. The exhibition is open daily from 11 am – 6 pm (closed on Mondays) and is free to view. This entry was posted on November 9, 2015 by mptask in Brighton, Corridor Gallery, December 2015, November 2015 and tagged art, art exhibition, brighton, collage, Corridor Gallery, installation, mixed media, print, sculpture, Seiko Kato.